Indeed--today I have been happier than a bird with a french fry--because FINALLY I have completed the cleaning, reorganization, and decorating of my plushie-making and crafting work space. 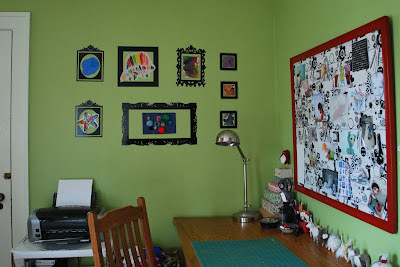 I was going to share some "before" photos with you here--but really, who cares about that? It was embarassingly messy, in desperate need of cleaning (I caught a whole litter of dust bunnies), and clausterphobically cluttered (that said, I did upload some photos on my Flickr page and you can view the full effort here). But this is the part I would think you might be interested in--the "after"--let me give you a little tour... These are the shelves Mr Beeper bought, assembled and stained for me--from Ikea. 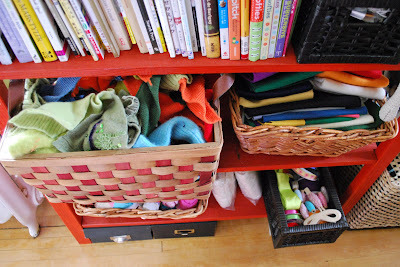 The baskets keep my jumble of felted wool sweaters in check. 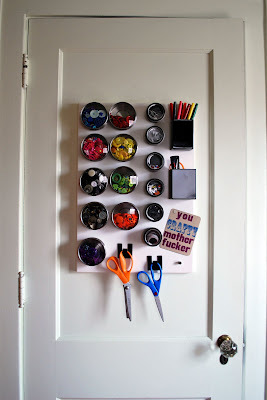 This magnet board was also purchased from Ikea--as well as the little black square pockets and hooks the scissors are hanging from, AND the round tins into which I have sorted my buttons by color. 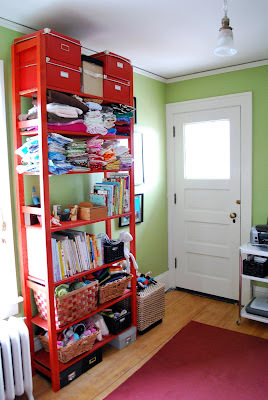 This enabled me to lift a whole buttload of clutter from my desk and relocate it to the back of the door--and no doubt will cut back on a lot of cussing everytime I go to use my desk now. 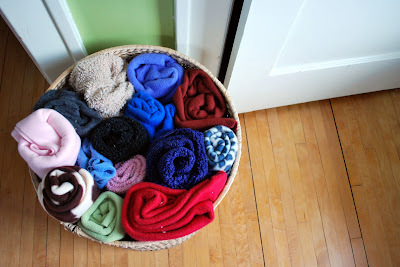 And here is a basket into which I have bundled all of my different colored fleece (some are actually reclaimed fleece pullover jackets, some just thrifted pieces of un-used fleece). My workshop has a door that goes out to the teeniest one-person size second-floor balcony--which you see here. Also, more of those same Ikea shelves that allow me to store crap almost to the ceiling. 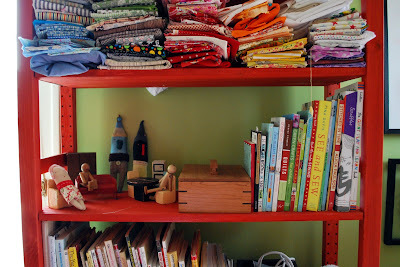 And this is my little walk-up dollhouse flat I have set up on the bookself. It reminds me of the teeny people who used to live behind the books on the shelves on Captain Kangaroo--which was always my favorite part of the program. 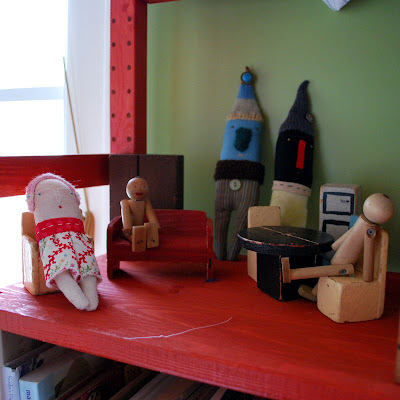 The folksy cloth dolls are from November Moon, and the wooden furniture is vintage--made from wood scraps, likely. Beeper loves this new set up and has already had his superheros over for a visit. 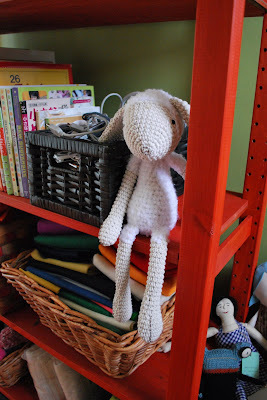 My melancholic sheep from Eveluche has found a corner on which to perch and sink into further despair. Some baskets that contain some more wool sweater scraps, an assortment of wool felt and a slew of ribbons that used to be unraveling from their spools and hanging willy-nilly around my craft closet. 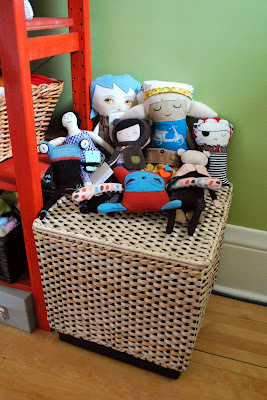 And here is a little party of plushies just waiting to happen, sitting atop a woven box that contains a pile of cashmere sweaters. 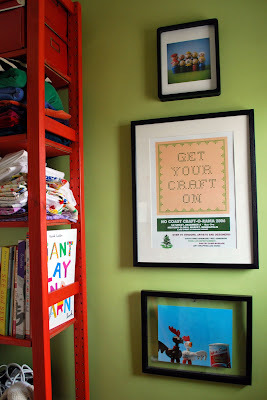 And after 2 years, I have finally hung up this poster from the No Coast Craft O'Rama that I have always loved (it was from the first year I participated in the sale). And then I added this funny little print of some toy chickens with a can of soup that a friend gave me for christmas this year (have I mentioned how much I love chickens? ), and on top--a new print of vintage Fisher Price little people (which I love more than chickens) I just ordered from E Soule (whose work I also love, by the way). And this is my desk and worktable. Mr Beeper also built that for me--but from scratch, not from Ikea. It is nice and long and strudy and lets me really spread my crap out everywhere. A little pyramid of cigar boxes I covered with Florentine paper and a cluster of pots and bowls to catch the miscellany. 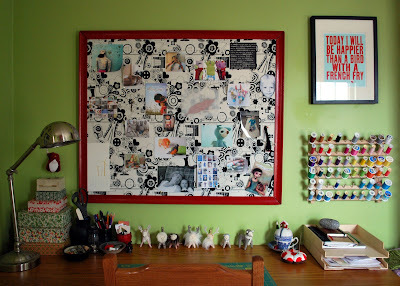 This is my freshly recovered inspiration board (it used to be covered with a sage green linen that just seemed to make it blend into the wall). The frame was reclaimed and repainted red by us, then we replaced the glass with some homasote and covered it with this designer print canvas weight cloth. 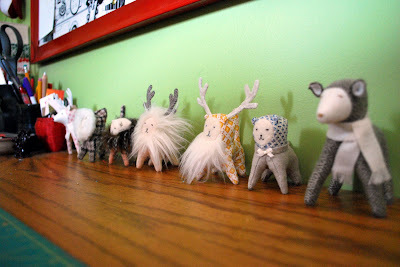 And this is my little herd of Fern Animals that always keep my company on my desk while I am working. And no, I do not have a problem and I can quit ordering Fern Animals anytime I want to, thanks--now mind your own business. 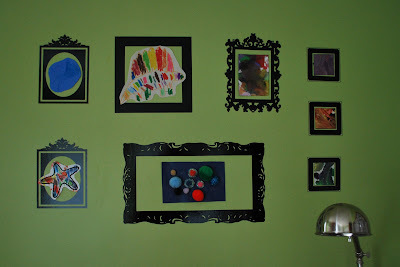 And then I also wanted to have a space I could hang up Beeper's latest artwork and easily swap out the pictures from week to week. So, I found these vinyl wall stickers that look like frames from Elephannie and Single Stone Studios--works like a charm, I tell you. 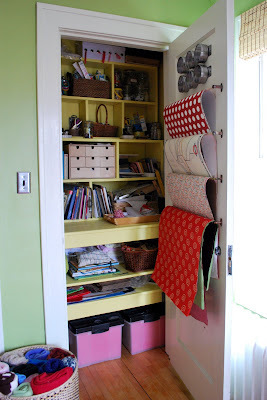 And finally, my craft closet. 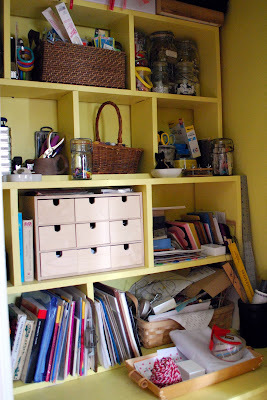 Mr Beeper built all the shelves and cubbies for me shortly after we bought our house and we painted it a lovely sunny yellow inside the closet, to contrast with with green walls. Mostly what changed in here is that it no longer looks like an area that requires safety gear to enter for fear of falling craft detritus. BUT the one thing we did add were these cafe curtain brackets and wooden dowels from which I have hung all my large papers. We actually had the hardware laying around in the basement from when we removed the dingy old cafe curtains in our livingroom when we moved in. 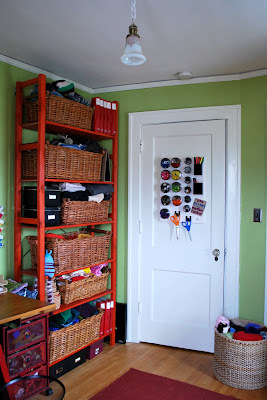 This is, perhaps, my favorite part of the whole workshop reorganization effort--I love the look of all those papers hanging so neatly inside the closet door. 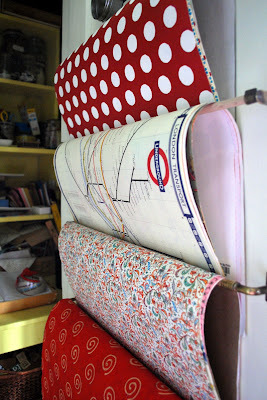 So, thanks for coming over and checking out my newly reorganized workshop. Now, maybe I can get to more plushie making and get around to that Etsy shop update...ciao, bebes. 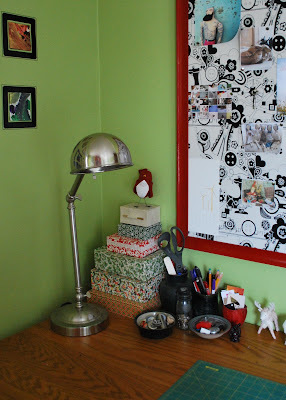 love your work, blog and work room! It´s really amazing!! 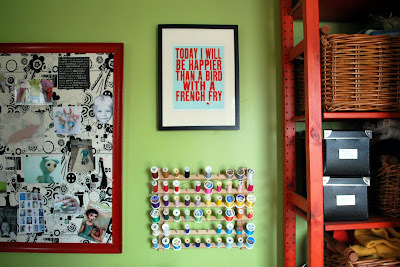 I loved looking at every little detail of your craft room! 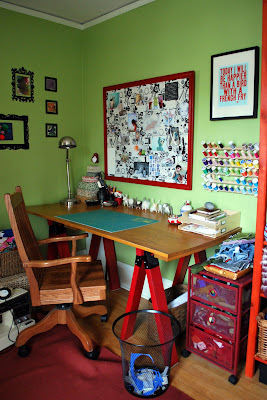 What a dream workspace!!! The decor, the colors, the organization...everything is perfect and inspiring! I love your work space! Wow....my studio is full of dust and dirt and STUFF. Inspiring!